This project didn't involve any sewing but it was a fun and easy way to use up a little fabric. It's the first project in the book, One Yard Wonders. You simply cut some cork board to the size of a picture frame and staple fabric around the board before you put it back in the frame. I obviously need to tack some snapshots or something onto this newly decorated message board but I am just enjoying the lovely framed AMH voile piece for now. So, my baby has definitely been giving me a run for my money lately. I am tired. I haven't had a full night's sleep in a long time. This afternoon, when she went down for what I knew would be a long nap, I said, "Screw it. I am going to take a long nap too." Now it's nearly 2 am and I can't sleep. She's sleeping and I am on the computer thinking about organizing a Christmas ornament swap. I am also trying to distract myself from ordering this and this from Hawthorne Threads. Would anyone be interested in making 6-12 of the same ornaments, sending them to others throughout the country, and receiving several handmade ornaments themselves? There are lots of tutorials out there that seem like fun and I love the look of handmade/patchwork decor. 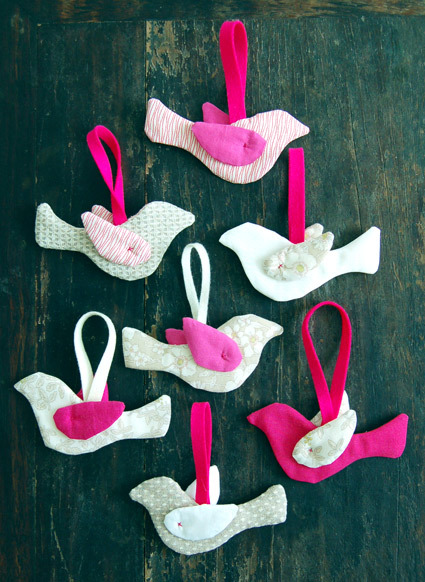 The only restrictions I would put forth would be that this swap would have to involve sewing the ornaments (i.e. very minimal - to no gluing), have a modern aesthetic (sorry, no Thimbleberries), and no craft felt (sorry - I've seen how badly that stuff deteriorates and I want these things to last a while). Finally, I made an armrest pincushion (tutorial by BMQG's very own Aimee at During Quiet Time) and a brainy ball for Alexis as a thank you for her significant role in making the BMQG quilt show happen. This blog may be a little quiet for the next few weeks because I have more gifts to make and I think the recipients might be blog readers. This picture is SO fun - so I had to start with it first. After the panel, "The Future of Quilting" that Rachel and I participated in, Mary and Marianne Fons came over to our gallery and took in our show. It wasn't long before they started dismantling our displays..... Just kidding - they had the great idea to have us hold Rebecca's awesome guild logo quilt for the above picture. Mary and Marianne were so fun, funny, warm, and encouraging. I really enjoyed visiting with them. I will do a post on the panel and what was discussed within the next couple of days. They really did love our show and I was excited for the few BMQG members who got to visit with them. Here's Alexis, Rebecca (holding Charlotte), Alice, and I manning the table on Friday afternoon. Sitting at the show was really a lot of fun. It was fun to chat with friends and interact with the show visitors. I had Charlotte with me for most of my shifts and she was a real trooper. The poor girl is not even 6 months and has already been to her fair share of quilting and fabric related events/venues. This is a selection of most of the mini quilts that were showcased. You can tell how diverse and talented our guild is from just this one picture. Here's Alice's Ghastlies quilt. I heard a rumor that a Mills resident asked her to sell it to her. That is a great compliment! I am so impressed that Lia managed to quilt this beautiful "Birds of Paradise" quilt on a longarm when she was 9 months pregnant. It is just gorgeous (pattern by Sarah Fielke). 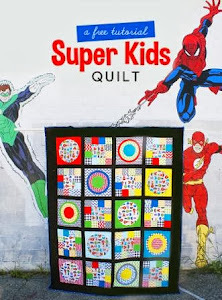 Here's Rebecca's stunner that has received a lot of attention from The Modern Quilt Guild. 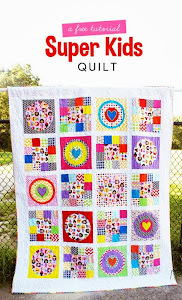 I love this beautiful quilt by Alexis. One of my favorite parts of the weekend was the Friday night reception. Lots of guild members attended with their friends and family. It was so fun to hang out with each other and celebrate the accomplishment of hosting a show at a major festival and we all couldn't get over at how professional and polished it all looked. I feel so indebted to all of the guild members who pitched in to make this possible. It was New Year's Eve morning (2011) that I received an email from the director of the New England Quilt Museum asking to meet with me. I was able to go over right away and I soon agreed to participate in the panel discussion as well as the guild show. I was 7 months pregnant and the commitment felt overwhelming. But it wasn't long before our guild members rallied together and this weekend was a very satisfying culmination of their efforts and passion for the guild. I won't name names but you know who you are - thank you so much!